Hot Stamping or Hot Foiling. It is still regularly used in many applications and can achieve results that are virtually impossible by any other method. High gloss metallic, holograms, wood grains. The composition of the foil means that it adheres to a vast range of materials and is protected by a really tough lacquer. David Hornby of Foilco Limited stated that his company is getting involved in more and more sophisticated applications where, in some instances, they supply a turn key system to apply security foils and special effects. “Gold Blocking” is still with us but it is the hybrid applications that are growing. He also finds that where a customer has no printing facility they are choosing foil more often. Foiling offers a simple method of achieving a robust print without the need for the costs of expensive systems to meet Health and Safety requirements. The foils comply with the requirements of Reach regulations, EN 71 and heavy metals limit requirements. 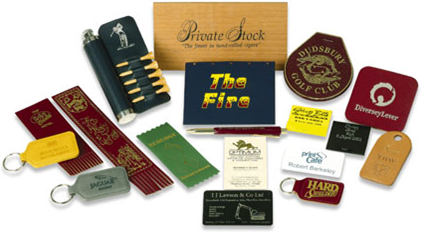 Foil can be laser engraved with unique codes for identification of the individual items and their contents. 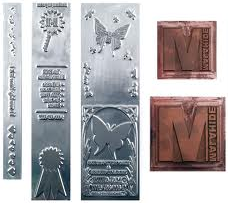 The specification of foil must therefore take the engraving without distortion. This is where technologies combine to serve the needs of the market. Above are just some of the applications for Hot Foil. To create the image heat and pressure are required. 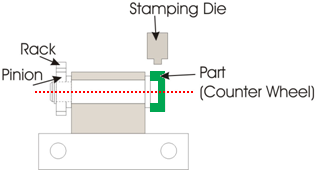 In its simplest form a heated platen and a die are pressed onto an object with the foil between the heated die and the object. The heat activates the adhesive on the foil and if the object is plastic softens the plastic. When the pressure is released and the die lifted away the image is left on the object as the foil peels off. 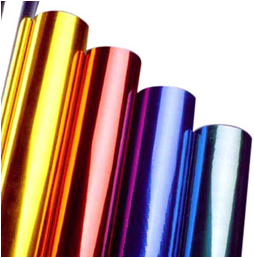 The foil itself is a polyester carrier with a release coat onto which a lacquer is coated, then either a metallic coating applied or a pigmented colour or pattern. Finally a heat activated adhesive. This combination is released from the polyester carrier and remains on the substrate to be printed. These machines can be hand operated but they are only used for the most basic applications virtually all industrial applications are pneumatically powered some really large machines use hydraulics or servo motors. The precise temperature, pressure and dwell time will depend on the type of foil and the material being printed. A good quality machine will allow you to adjust all these parameters. Both automatic and manual machines work on the same principle but the automatic machine provides much more consistent results and can be programmed for repeat applications. 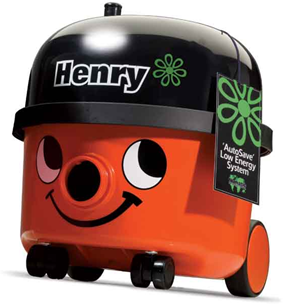 As you move up the scale of automatic machines the pressures that can be applied can increase to Tonnes when required. There are numerous suppliers of equipment throughout the world. 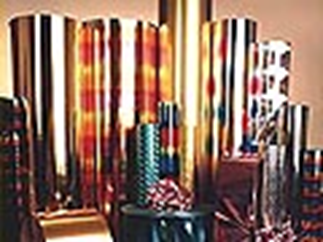 Another method of applying film to a substrate is the roll on method. 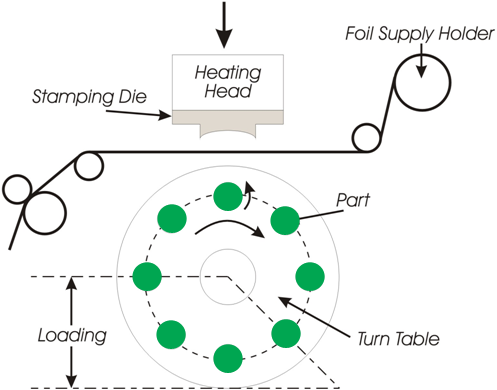 This is where a heated cylinder of silicone rubber is used to provide the pressure and heat for a specific length of time. 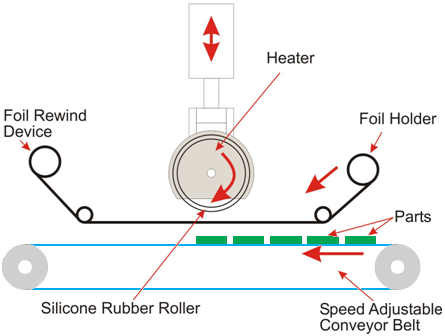 Widely used for applying foil to extrusions or other long lengths of material such as picture frames the roll on method can also apply foil to a series of objects that are fed through the machine as long as the height of the print surface is constant. Many of the wood-grain finishes seen in the market are actually foiled. 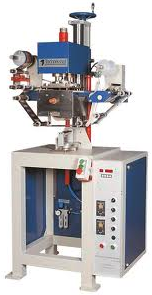 Although some roll on machines can use rotary dies most dies are used on vertical machines they are made from brass, steel, and magnesium or silicone rubber. Generally metal is used if the surface has to be debossed (image impressed into the surface.) Silicone rubber is more forgiving and will conform to some irregularities in the surface so tends to be the most widely used. Sometimes the die is metal coated with silicone rubber. Selection is dependent on your application. 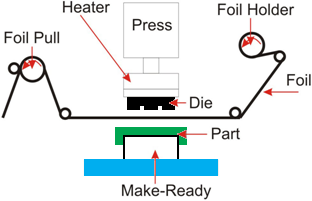 Production of these dies should be done by specialists as it is not just a matter of getting the shape correct but conduction of heat through the die is important. Metal dies heat up and recover quicker than silicone. 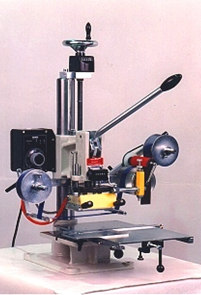 For different objects there are a range of configurations of jigs and feeding methods. Peripheral printing is a common technique and it can be achieved in several different ways. The simplest is to have a flat die and roll the bottle underneath it. 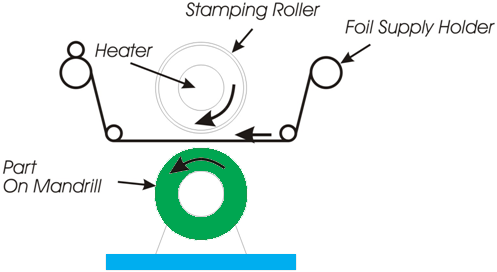 The rolling movement can be driven through a gear or simply friction. 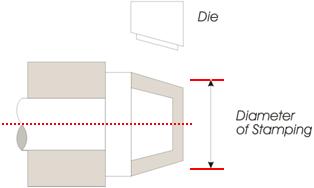 A conical part can be printed in the same roll on method as shown above but the die has to be angled to suit the slope. Using a roller enables a is an alternative that is faster than using a flat die but the roller is expensive as it has to be produced using 3D engraving. Silicone dies do work but they are expensive to produce. If a machine can be dedicated to one component the method of using a vertical down stroke and a rotary multiple jig is an interesting option. Flexible bottle foiling is challenging and requires carefully made tooling to support the bottle when it is pressurised. It is relatively slow but very effective. You really do need expert advice if you want to take this route. Foiling needs no solvents or hazardous chemicals. It is a dry process. Machines must be properly guarded as the can exert a great deal of force and the die and surrounding machine parts get very hot. Correctly guarded the process is very safe to use. Hot foiling needs minimal skill to operate but accurate setting is vital best served by the use of top quality dies and jigging nests. 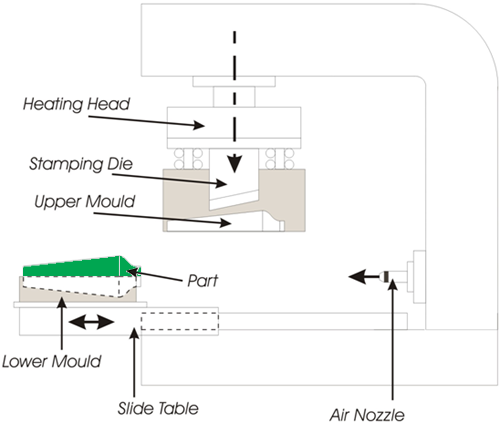 The jigs must keep the substrate/object stable and well supported to withstand the load applied by the machine. They are best purchased with the die as a pair. Foil is available from many suppliers but for difficult applications care must be taken in selecting the most suitable foil. 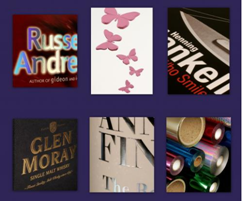 Allied to Hot Foil printing is the use and application of heat applied transfers. 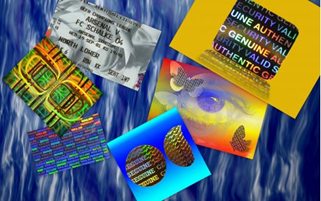 Unlike hot foil where a continuous coating or image is created on the foils and then applied to the substrate Heat Applied Transfers are discrete images that are applied in the same way but the transfer feed mechanism has to be very precise so that the transfer is positioned correctly. General these transfers are screen printed but on very large quantities they are gravure printed onto the carrier foil. Their construction is the same a foil with a release layer, protective lacquer, image and heat activated adhesive. Origination costs can be considerable but the end results are very effective. 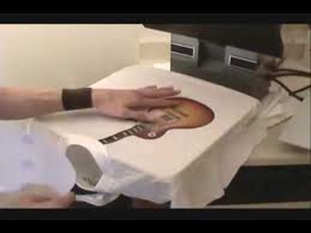 These transfers differ from the type that are applied to textiles where they are generally screen printed and use plastisol inks or sublimation inks. The textile transfers that are closer to the ones that are applied to solid materials are those used in applications where they have to be laundered in industrial laundries. These are multi-layer transfers that have to be very carefully constructed to withstand the arduous conditions of a laundering.